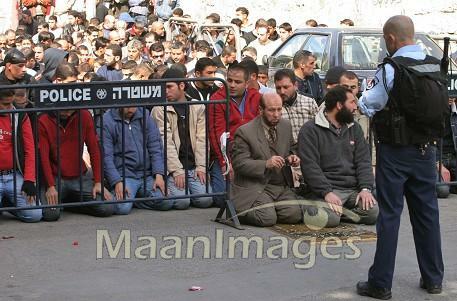 Has this Israeli policeman taken the place of God Himself? You would think that a people that has been discriminated against for centuries would be more sensitive when it comes to discriminating against others. This is apparently not the case when it comes to Israel and its lack of sensitivity towards its Muslim citizens. This has been demonstrated most recently by excavational digs in the vicinity of Islam’s third holiest site, also the holiest site of Judaism. Despite objections from Jordan, which has a formal role in the maintenance of Jerusalem’s Muslim holy sites, the work continues. This also despite the outcry of the entire Muslim populaion of Israel and Palestine. For the past few Fridays, most of the faithful were barred from entering the compound by Israeli forces… including the Arab Israeli chief of Israel’s Islamic movement, Sheikh Raed Salah, who was arrested with six other activists after a dispute with officers.Thousands of these worshippers were forced to pray outside of the compound under the eye of the Israeli army and police. The very people that SCREAM anti Semitsm when they are merely looked at crosseyed are denying a people the right to pray. These very people who for decades had to hide their identities in various parts of Europe so they could pray in secret. These very people who proclaim to the world ” NEVER AGAIN” …. are doing it again themselves. And yet they will sit on Monday with representatives of the United States and Palestine to discuss peace…. One can already see what the outcome of those talks will be with the attitudes that Israel already has. THIS article from the Palestine News Network speaks of latest developements.